Dr. Jane Goodall is best known for her dedication and work around endangered species, particularly chimpanzees. Currently, she travels 300 days per year giving lectures all over the world. This year, Dr. Goodall celebrates her 80th birthday and the release of her most recent book, “Seeds of Hope”. Melissa Seymour: Hello, Dr. Goodall! Thank you so much for joining us! What was it like seeing a chimpanzee in the wild for the very first time? What was running through your mind? 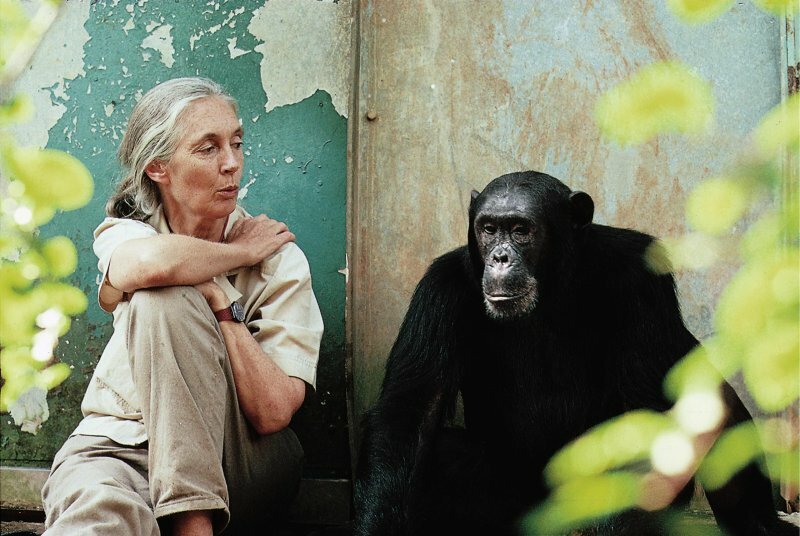 Dr. Jane Goodall: The first chimpanzee I saw took one look and ran off. As did they all for the next few months. What was running through my mind? If this goes on and the money runs out, this will be the end and I’ll have let Louis Leaky down. MS: What has working with chimpanzees taught you about life? DJG: That we humans are not the only beings on the planet with personalities, minds capable of rational thought, and above all, emotions. Now we know many other animals have intellectual capabilities once thought unique to us. MS: How do you think people should treat our environment and world? Why is this so important? DJG: We are using the planet’s natural resources as though they are infinite. They are finite. We cannot go on like this if we care about our grandchildren and theirs. We are stealing their future. We must change our attitudes. Also, animals need us to respect them. The way we abuse them is so terrible. The billions of animals raised for food around the world—this process is destroying the planet. Vast areas of forest are cut down to make space for growing grain, or grazing. Vast amounts of methane gases are produced—a worse greenhouse gas than C02. There are also the problems of poaching, sport hunting, puppy mills, animals exploited in entertainment—circus, advertising. Pollutants from agri-business, industry, households, golf courses, leaching into rivers, and the sea. Oceans are becoming less able to absorb C02, loss of species, climate change—what does this mean for those to follow us? MS: What makes Gombe National Park your favorite place on earth? What is it like? DJG: A rain forest. All life intertwined. Home to the chimpanzees we have studied since 1960. I sense a great spiritual power and feel part of the cycle of life. DJG: When I went to Cambridge University for my PHD, with no college experience of any sort, I was told I had done my study all wrong—I should not have named the chimps for numbers were more scientific. I could not talk about them having minds, personalities, or emotions—they are unique to us humans, I was told. Luckily, my childhood dog Rusty had taught me that the professors were wrong. And so I carried on, but learned how to write about it in a scientific way. And I got my PHD! MS: Congratulations on your new book! Why did you decided to write “Seeds of Hope”? DJG: I wrote a long section of plants for my previous book “Hope for Animals and Their World”. However, it became too long and the publishers suggested that my coauthor, Gail Hudson, and I cut it out. I was sad because so many botanists had helped. I decided to do a whole book—and what a fabulous journey it has been. DJG: My mother. From the start she supported me. When everyone else laughed at my dreams of Africa, she said, “If you really want something you will have to work hard, take advantage of opportunities, and never give up.” She found books for me to read (about animals), thinking that I would then learn to read more quickly. When the British authorities of what was then Tanganyika British Protectorate, refused permission for a young girl, straight from England, into the forest with potentially dangerous animals they finally gave in to Louis Leakey. However, they said I had to have a companion. My mother volunteered. Money for six months and she was there for the first four months—she helped boost my morale when the chimpanzees initially ran off at first sight. Pointing out those things I was learning, albeit from a distance. For the rest of her life, she was my best friend. Thank you for this interview. Dr. Goodall is one of my heros. I, too, am fascinated by human/animal relationships and by animals’ emotions. Take the squirrel for example. I’ve seen them use the power lines to safely cross the busy street near my home. I’ve also witnessed one venture out on the road to carry off the dead body of a recently killed squirrel. My father-in-law once shot a squirrel then had to watch as another squirrel came out from behind a tree and laid on top of the dead squirrel. My father-in-law never shot another squirrel. Thank you for sharing this wonderful interview. I marvel at her work and drive. May she keep influencing many people with her ways and speeches.